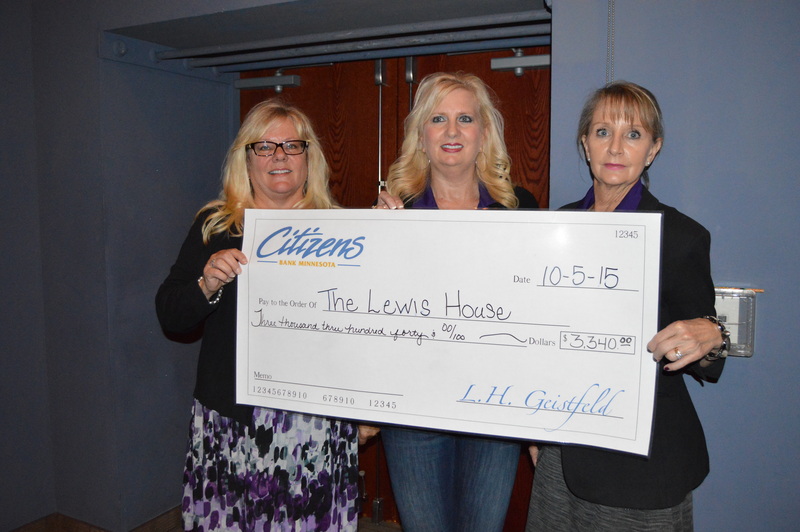 It was a magical evening as Citizens Bank Minnesota hosted theGirls Night Out on Monday, October 5th at the Lakeville Arts Center, raising, $3,340 through ticket sales which was donated to the Lewis House. Citizens sponsored the entertainment and food. The afternoon started with shopping at local downtown businesses then moved to the Lakeville Area Arts Center for happy hour and appetizers followed by musical entertainment by “Sister”. “Sister’s” music had inspirational messages that energized us to prioritize our amazing plans and goals by putting ourselves first on the list. The Lewis House first opened its doors on August 28, 1979 not far from where the current Eagan Lewis House stands today. It is named after the late Senator B. Robert Lewis, who authored legislation to aid women in abusive relationships and to stem family violence. The home was purchased with Community Development Block Grant (CDBG) funding and was welcomed into the community by the surrounding neighbors who made it their mission to watch out for the fragile families inside. During that first year, 41 women and 64 children received safe housing at Lewis House. In 1985, 360 Communities broke ground on the current Lewis House in Eagan, which was the first shelter in the United States built for the purpose of being a battered women’s shelter. To become part of theGirls! is rather simple – be a female client of Citizens and have an email address. If you are already a client, please send your primary email address to Lori Dummer at thegirls@citizensmn.com to be included in future emails. If you are not a client, please stop by Citizens Bank Minnesota’s Lakeville Branch next to Lakeville’s Super Target to open your account today and start enjoying all the benefits Citizens has to offer. You can also check us out on the web at www.citizensmn.com.